Serial Underground, “the subversive nightclub series” (Time Out NY), will be back at The Cornelia Street Café this Sunday Night, November 7th. Jed Distler, the show’s curator and host, and the artistic director of ComposersCollaborative, from which Serial Underground was born, agreed to talk with us a little about the series, and to preview this Sunday’s show. What exactly is Serial Underground? How did it first come about? It’s essentially a new music variety show, with occasional spoken word, theatrical and visual components. The series began in 2004 with a focus on artists who mainly work in contemporary classical music, with opportunities to showcase ongoing new work at various stages in progress. Later on we established mini-residencies where either a soloist, ensemble or composer would be on two or three shows during the season. In the past we’ve scheduled at least three “acts” per show (sometimes more). However, with our new first Sunday of the month slot and 6:00 PM start time, we’ll try a “two act” format, which I think will help focus and tighten the evening. Tell us more about ComposersCollaborative? My wife Célia Cooke and myself started the organization in 1987, when I was a young(ish) composer and pianist trying to get my stuff out there. 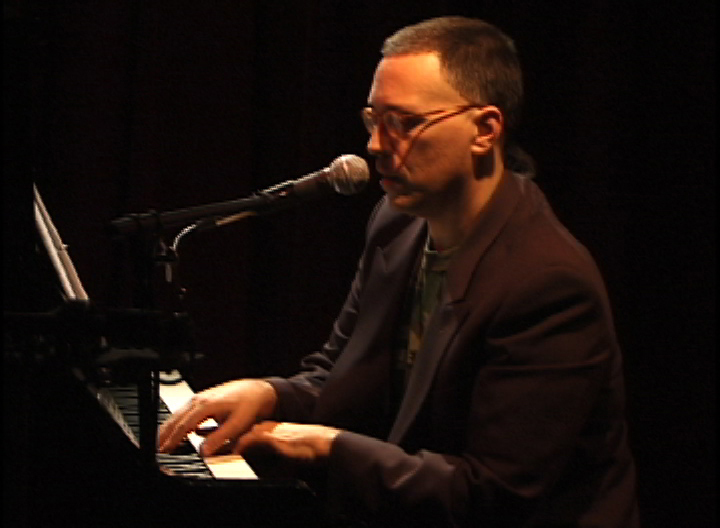 We began a solo piano series in 1994 that lasted nearly ten years. As more of the pianists we presented began to offer multi-media and collaborative works, it made sense to create more opportunities for these kinds of projects, first through our Non Sequitur summer festivals, and, of course, on Serial. One thing I’ve always loved about the series is the way you balance the eclecticism of the evening so beautifully with the depth of the performances. Each part of the evening feels whole and complete, and yet you’re able to move so fluidly from, say, a reading of a play to a piece of music, etc. Do you think that’s what makes the show so unique, or do find it just reflects the caliber of the artists you bring to the show – or both? Both, for sure. Artistic quality is first and foremost, but I give lots of thought to running order, pacing, how long each “set” should be, and similar considerations. For example, you can have two excellent 30-minute compositions that are mostly lyrical, abstract and introspective, yet I’d never program them on the same evening. If you want to do, say a 20-minute set made up of short works, you cannot take lots of time between pieces, fumbling around with music stands, equipment, tuning the instruments, and so forth. It’s important to me that each show should feel intimate and informal, yet fluid and alive at all times. I think this comes from my long background working in theater and dance situations, and perhaps from having played hundreds of club dates in my youth, when you had to make smooth segueways between songs. What can we expect to see this Sunday? The young composer/violinist ANA has a gorgeous new CD out on the Innova label, and she’ll offer selections from it, with guest pianist Kathleen Supové. Our longtime director Arnold Barkus will present new play called When You Awake You Will Remember Everything, and he’ll be performing a generous excerpt from it together with Nancy Castle, an actor who, incidentally, was on the very first Serial back in October 2004. And I’m going to open with a brief piece, but you have to come to the show to find out what it is! Can you preview anything for us from shows in the months ahead? Go to our website, where we list all upcoming events. However, you can expect substantial opera/music theater premiers by composers Matt Aucoin, Ben Arthur, Jonathan Dawe and Virko Baley, pianist Jenny Lin returning in February, and, the following month, a rare chance to hear new music practitioners pianist Blair McMillen and the Momenta Quartet join forces for…hold on to your hats…the Brahms Piano Quintet! And that show opens with a wild new solo percussion piece by Rex Benincasa. Talk about a provocative bill! You are currently browsing entries tagged with jed distler at Cornelia Street Café.